Now Greece has been isolated. If some how the Greek issue could be addressed, EMU problems would go away, many officials and investors imply. Spain has been embraced as the good example in contrast to Greece. It is supposed to show that ordo-liberal inspired austerity and reforms do generate positive results. In fact, earlier this week, Spain sold 6-month bills with an ever so slight negative yield. The on-the-run two-year yield is less than a single basis point. 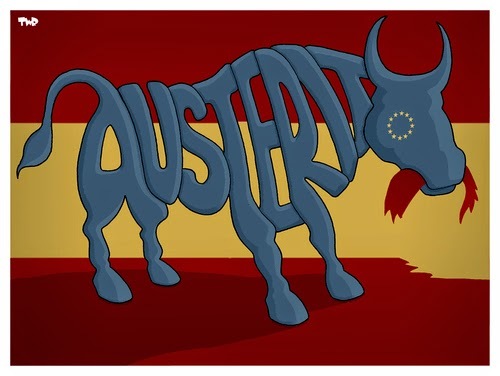 Spain's economic growth is expected to be among the strongest in the euro area. The Bank of Spain expects GDP to expand by 2.8% this year after 1.4% last year. Spain has tried to copy the German model. Last year it exported a third of its GDP. Unions have become somewhat more flexible and this has helped facilitated a new division of labor with a growing auto sector moving to Spain. The car industry reportedly added 25k jobs last year. In Europe, only Germany produces more cars that Spain. Prime Minister Rajoy embraces this narrative and is pinning his political future on it. He insists that the economic recovery will bolster his support in the polls ahead of the national election at the end of the year. The only problem is that is not working. Last month's election in Andalusia saw Rajoy's Popular Party support fell to 27% from 41%. There is another round of local and regional elections at the end of next month. The PP may not do much better. A recent survey showed 3 of 4 Spaniards have an unfavorable opinion of the Prime Minister. Politically, there is the beginning of a centrist alternative to the PP. Ciudadanos, with roots in Catalonia is trying to become a national alternative. It drew 9% of the votes in Andalusia. Pomdemos, the left alternative took 15% of the votes. Rajoy emphasizes the macro-performance, but it has not trickled down. In Andalusia for example, 1 in three is unemployment. Nationwide, it is around 1 in 4. The macro data like growth and trade balances and the like do not capture the loss of living standards in Spain. Simply, if crudely, even though who have jobs are not better off. As in other countries, there is weak leadership. The important point is that returning to growth after the crisis may not be sufficient to facilitate political stability. The damage to the middle class is serious and Rajoy does not appear to appreciate that. The economic cost of austerity is still being calculated. There will be a political price in some countries and Spain is one of them. It is not Greece, but it is not the poster child of success that the ordo-liberals in Berlin and Brussels would have it either.